A cytoskeleton is present in the cytoplasm of all cells, including bacteria, and archaea. It is a complex, dynamic network of interlinking protein filaments that extends from the cell nucleus to the cell membrane. The cytoskeletal systems of different organisms are composed of similar proteins. In eukaryotes, the cytoskeletal matrix is a dynamic structure composed of three main proteins, which are capable of rapid growth or disassembly dependent on the cell's requirements. The structure, function and dynamic behavior of the cytoskeleton can be very different, depending on organism and cell type. Even within one cell the cytoskeleton can change through association with other proteins and the previous history of the network. A multitude of functions can be performed by the cytoskeleton. Its primary function is to give the cell its shape and mechanical resistance to deformation, and through association with extracellular connective tissue and other cells it stabilizes entire tissues. The cytoskeleton can also contract, thereby deforming the cell and the cell's environment and allowing cells to migrate. Moreover, it is involved in many cell signaling pathways: in the uptake of extracellular material (endocytosis), segregates chromosomes during cellular division, is involved in cytokinesis (the division of a mother cell into two daughter cells), provides a scaffold to organize the contents of the cell in space  and for intracellular transport (for example, the movement of vesicles and organelles within the cell); and can be a template for the construction of a cell wall. Furthermore, it forms specialized structures, such as flagella, cilia, lamellipodia and podosomes. A large-scale example of an action performed by the cytoskeleton is muscle contraction. This is carried out by groups of highly specialized cells working together. A main component in the cytoskeleton that helps show the true function of this muscle contraction is the microfilament. Microfilaments are composed of the most abundant cellular protein known as actin. During contraction of a muscle, within each muscle cell, myosin molecular motors collectively exert forces on parallel actin filaments. Muscle contraction starts from nerve impulses which then causes increased amounts of calcium to be released from the sarcoplasmic reticulum. Increases in calcium in the cytosol allows muscle contraction to begin with the help of two proteins, tropomyosin and troponin. Tropomyosin inhibits the interaction between actin and myosin, while troponin senses the increase in calcium and releases the inhibition. This action contracts the muscle cell, and through the synchronous process in many muscle cells, the entire muscle. In 1903, Nikolai K. Koltsov proposed that the shape of cells was determined by a network of tubules that he termed the cytoskeleton. The concept of a protein mosaic that dynamically coordinated cytoplasmic biochemistry was proposed by Rudolph Peters in 1929 while the term (cytosquelette, in French) was first introduced by French embryologist Paul Wintrebert in 1931. Initially, it was thought that the cytoskeleton was exclusive to eukaryotes but in 1992, it was discovered to be present in prokaryotes as well. This discovery came after the realization that bacteria possess proteins that are homologous to tubulin and actin; the main components of the eukaryotic cytoskeleton. Eukaryotic cells contain three main kinds of cytoskeletal filaments: microfilaments, microtubules, and intermediate filaments. Each type is formed by the polymerization of a distinct type of protein subunit and has its own characteristic shape and intracellular distribution. Microfilaments are polymers of the protein actin and are 7 nm in diameter. 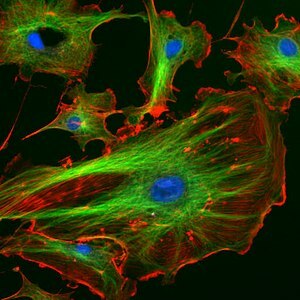 Microtubules are composed of tubulin and are 25 nm in diameter. Intermediate filaments are composed of various proteins, depending on the type of cell in which they are found; they are normally 8-12 nm in diameter. The cytoskeleton provides the cell with structure and shape, and by excluding macromolecules from some of the cytosol, it adds to the level of macromolecular crowding in this compartment. Cytoskeletal elements interact extensively and intimately with cellular membranes. Research into neurodegenerative disorders such as Parkinson's disease, Alzheimer's disease, Huntington's disease, and amyotrophic lateral sclerosis (ALS) indicate that the cytoskeleton is affected in these diseases. Parkinson's disease is marked by the degradation of neurons, resulting in tremors, rigidity, and other non-motor symptoms. Research has shown that microtubule assembly and stability in the cytoskeleton is compromised causing the neurons to degrade over time. In Alzheimer's disease, tau proteins which stabilize microtubules, malfunction in the progression of the disease, causing pathology with the cytoskeleton. Excess glutamine in the Huntington protein which is involved with linking vesicles to the cytoskeleton is also proposed to be a factor in the development of Huntington's disease. Amyotrophic lateral sclerosis which results in a loss of movement caused by the degradation of motor neurons is also seen to involve defects in the cytoskeleton. A number of small-molecule cytoskeletal drugs have been discovered that interact with actin and microtubules. These compounds have proven useful in studying the cytoskeleton and several have clinical applications. All filaments interact with accessory proteins that regulate and link the filaments to other cell compounds and each other. The accessory proteins are essential for controlled assembly of cytoskeletal filaments in particular locations, and they include motor proteins. Microfilaments, also known as actin filaments, are composed of linear polymers of G-actin proteins, and generate force when the growing (plus) end of the filament pushes against a barrier, such as the cell membrane. They also act as tracks for the movement of myosin molecules that affix to the microfilament and "walk" along them. In general, the major component or protein of microfilaments are actin. The G-actin monomer combines to form a polymer which continues to form the microfilament (actin filament). These subunits then assemble into two chains that intertwine into what is called, F-actin chains. Myosin motoring along F-actin filaments generates contractile forces in so-called actomyosin fibers, both in muscle as well as most non-muscle cell types. Actin structures are controlled by the Rho family of small GTP-binding proteins such as Rho itself for contractile acto-myosin filaments ("stress fibers"), Rac for lamellipodia and Cdc42 for filopodia. Intermediate filaments are a part of the cytoskeleton of many eukaryotic cells. These filaments, averaging 10 nanometers in diameter, are more stable (strongly bound) than microfilaments, and heterogeneous constituents of the cytoskeleton. Like actin filaments, they function in the maintenance of cell-shape by bearing tension (microtubules, by contrast, resist compression but can also bear tension during mitosis and during the positioning of the centrosome). Intermediate filaments organize the internal tridimensional structure of the cell, anchoring organelles and serving as structural components of the nuclear lamina. They also participate in some cell-cell and cell-matrix junctions. Nuclear lamina exist in all animals and all tissues. Some animals like the fruit fly do not have any cytoplasmic intermediate filaments. In those animals that express cytoplasmic intermediate filaments, these are tissue specific. Keratin intermediate filaments in epithelial cells provide protection for different mechanical stresses the skin may endure. They also provide protection for organs against metabolic, oxidative, and chemical stresses. Strengthening of epithelial cells with these intermediate filaments may prevent onset of apoptosis, or cell death, by reducing the probability of stress. Intermediate filaments are most commonly known as the support system or “scaffolding” for the cell and nucleus while also playing a role in some cell functions. In combination with proteins and desmosomes, the intermediate filaments form cell-cell connections and anchor the cell-matrix junctions that are used in messaging between cells as well as vital functions of the cell. These connections allow the cell to communicate through the desmosome of multiple cells to adjust structures of the tissue based on signals from the cells environment. Mutations in the IF proteins have been shown to cause serious medical issues such as premature aging, desmin mutations compromising organs, Alexander Disease, and muscular dystrophy. Microtubules are hollow cylinders about 23 nm in diameter (lumen = approximately 15 nm in diameter), most commonly comprising 13 protofilaments that, in turn, are polymers of alpha and beta tubulin. They have a very dynamic behavior, binding GTP for polymerization. They are commonly organized by the centrosome. Cross section diagram through the cilium shows the “9 + 2” arrangement of microtubules. In addition to the roles described above, Stuart Hameroff and Roger Penrose have proposed that microtubules function in consciousness. Spectrin is a cytoskeletal protein that lines the intracellular side of the plasma membrane in eukaryotic cells. Spectrin forms pentagonal or hexagonal arrangements, forming a scaffolding and playing an important role in maintenance of plasma membrane integrity and cytoskeletal structure. In budding yeast (an important model organism), actin forms cortical patches, actin cables, and a cytokinetic ring and the cap. Cortical patches are discrete actin bodies on the membrane and are vital for endocytosis, especially the recycling of glucan synthase which is important for cell wall synthesis. Actin cables are bundles of actin filaments and are involved in the transport of vesicles towards the cap (which contains a number of different proteins to polarize cell growth) and in the positioning of mitochondria. The cytokinetic ring forms and constricts around the site of cell division. Prior to the work of Jones et al., 2001, the cell wall was believed to be the deciding factor for many bacterial cell shapes, including rods and spirals. When studied, many misshapen bacteria were found to have mutations linked to development of a cell envelope. The cytoskeleton was once thought to be a feature only of eukaryotic cells, but homologues to all the major proteins of the eukaryotic cytoskeleton have been found in prokaryotes. Harold Erickson notes that before 1992, only eukaryotes were believed to have cytoskeleton components. However, research in the early '90s suggested that bacteria and archaea had homologues of actin and tubulin, and that these were the basis of eukaryotic microtubules and microfilaments. Although the evolutionary relationships are so distant that they are not obvious from protein sequence comparisons alone, the similarity of their three-dimensional structures and similar functions in maintaining cell shape and polarity provides strong evidence that the eukaryotic and prokaryotic cytoskeletons are truly homologous. Three laboratories independently discovered that FtsZ, a protein already known as a key player in bacterial cytokinesis, had the "tubulin signature sequence" present in all α-, β-, and γ-tubulins. However, some structures in the bacterial cytoskeleton may not have been identified as of yet. Some plasmids encode a separate system that involves an actin-like protein ParM. Filaments of ParM exhibit dynamic instability, and may partition plasmid DNA into the dividing daughter cells by a mechanism analogous to that used by microtubules during eukaryotic mitosis. The bacterium Caulobacter crescentus contains a third protein, crescentin, that is related to the intermediate filaments of eukaryotic cells. Crescentin is also involved in maintaining cell shape, such as helical and vibrioid forms of bacteria, but the mechanism by which it does this is currently unclear. Additionally, curvature could be described by the displacement of crescentic filaments, after the disruption of peptidoglycan synthesis. Tubulin-like proteins are tubulin in eukaryotes and FtsZ, TubZ, RepX in prokaryotes. Actin-like proteins are actin in eukaryotes and MreB, FtsA in prokaryotes. An example of a WACA-proteins, which are mostly found in prokaryotes, is MinD. Examples for intermediate filaments, which have almost exclusively been found in animals (i.e. eukaryotes) are the lamins, keratins, vimentin, neurofilaments, and desmin. Although tubulin-like proteins share some amino acid sequence similarity, their equivalence in protein-fold and the similarity in the GTP binding site is more striking. The same holds true for the actin-like proteins and their structure and ATP binding domain. Cytoskeletal proteins are usually correlated with cell shape, DNA segregation and cell division in prokaryotes and eukaryotes. Which proteins fulfill which task is very different. For example, DNA segregation in all eukaryotes happens through use of tubulin, but in prokaryotes either WACA proteins, actin-like or tubulin-like proteins can be used. 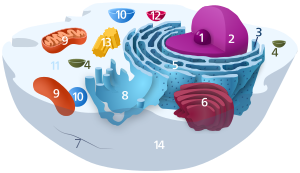 Cell division is mediated in eukaryotes by actin, but in prokaryotes usually by tubulin-like (often FtsZ-ring) proteins and sometimes (Crenarchaeota) ESCRT-III, which in eukaryotes still has a role in the last step of division. Cytoplasmic streaming, also known as cylcosis, is the active movement of a cell’s contents along the components of the cytoskeleton. While mainly seen in plants, all cell types use this process for transportation of waste, nutrients, and organelles to other parts of the cell. Plant and algae cells are generally larger than many other cells; so cytoplasmic streaming is important in these types of cells. This is because the cell’s extra volume requires cytoplasmic streaming in order to move organelles throughout the entire cell. Organelles move along microfilaments in the cytoskeleton driven by myosin motors binding and pushing along actin filament bundles. ^ a b Hardin, Jeff; Bertoni, Gregory; Kleinsmith, Lewis J. (2015). Becker's World of the Cell (8th ed.). New York: Pearson. pp. 422–446. ISBN 978013399939-6. ^ McKinley, Michael; Dean O'Loughlin, Valerie; Pennefather-O'Brien, Elizabeth; Harris, Ronald (2015). Human Anatomy (4th ed.). New York: McGraw Hill Education. p. 29. ISBN 978-0-07-352573-0. ^ a b c d e Alberts, Bruce; et al. (2008). Molecular Biology of the Cell (5th ed.). New York: Garland Science. ISBN 978-0-8153-4105-5. ^ a b c d e f Wickstead B, Gull K (August 2011). "The evolution of the cytoskeleton". The Journal of Cell Biology. 194 (4): 513–25. doi:10.1083/jcb.201102065. PMC 3160578. PMID 21859859. ^ a b c Fletcher DA, Mullins RD (January 2010). "Cell mechanics and the cytoskeleton". Nature. 463 (7280): 485–92. Bibcode:2010Natur.463..485F. doi:10.1038/nature08908. PMC 2851742. PMID 20110992. ^ a b Herrmann H, Bär H, Kreplak L, Strelkov SV, Aebi U (July 2007). "Intermediate filaments: from cell architecture to nanomechanics". Nature Reviews Molecular Cell Biology. 8 (7): 562–73. doi:10.1038/nrm2197. PMID 17551517. ^ Geli MI, Riezman H (April 1998). "Endocytic internalization in yeast and animal cells: similar and different". Journal of Cell Science. 111 (8): 1031–7. PMID 9512499. ^ a b Cooper, Geoffrey M. (2000). "Actin, Myosin, and Cell Movement". The Cell: A Molecular Approach. 2nd Edition. Archived from the original on 2018-04-28. ^ Berg, Jeremy M.; Tymoczko, John L.; Stryer, Lubert (2002). "Myosins Move Along Actin Filaments". Biochemistry. 5th Edition. Archived from the original on 2018-05-02. ^ Peters RA. "The Harben Lectures, 1929. Reprinted in: Peters, R. A. (1963) Biochemical lesions and lethal synthesis, p. 216. Pergamon Press, Oxford". ^ Frixione E (June 2000). "Recurring views on the structure and function of the cytoskeleton: a 300-year epic". Cell Motility and the Cytoskeleton. 46 (2): 73–94. doi:10.1002/1097-0169(200006)46:2<73::AID-CM1>3.0.CO;2-0. PMID 10891854. ^ Hardin, Jeff (2015-12-03). Becker's World of the Cell (9th ed.). Pearson. p. 351. ISBN 978-0-321-93492-5. ^ Elsevier. "Discovery of Quantum Vibrations in "Microtubules" Inside Brain Neurons Corroborates Controversial 20-Year-Old Theory of Consciousness". www.elsevier.com. Archived from the original on 2016-11-07. Retrieved 2017-11-20. ^ Wickstead, Bill; Gull, Keith (22 August 2011). "The evolution of the cytoskeleton". The Journal of Cell Biology. 194 (4): 513–525. doi:10.1083/jcb.201102065. PMC 3160578. PMID 21859859. ^ Minton AP (October 1992). "Confinement as a determinant of macromolecular structure and reactivity". Biophysical Journal. 63 (4): 1090–100. Bibcode:1992BpJ....63.1090M. doi:10.1016/S0006-3495(92)81663-6. PMC 1262248. PMID 1420928. Archived from the original on 2013-05-15. ^ Doherty GJ, McMahon HT (2008). "Mediation, modulation, and consequences of membrane-cytoskeleton interactions". Annual Review of Biophysics. 37: 65–95. doi:10.1146/annurev.biophys.37.032807.125912. PMID 18573073. ^ Pellegrini, Laura; Wetzel, Andrea; Grannó, Simone; Heaton, George; Harvey, Kirsten (2017-02-01). "Back to the tubule: microtubule dynamics in Parkinson's disease". Cellular and Molecular Life Sciences. 74 (3): 409–434. doi:10.1007/s00018-016-2351-6. ISSN 1420-682X. PMC 5241350. PMID 27600680. ^ Bamburg, James R.; Bloom, George S. (2009). "Cytoskeletal Pathologies of Alzheimer Disease". Cell Motility and the Cytoskeleton. 66 (8): 635–649. doi:10.1002/cm.20388. ISSN 0886-1544. PMC 2754410. PMID 19479823. ^ Caviston, Juliane P.; Holzbaur, Erika L.F. (2009). "Huntingtin as an essential integrator of intracellular vesicular trafficking". Trends in Cell Biology. 19 (4): 147–155. doi:10.1016/j.tcb.2009.01.005. PMC 2930405. PMID 19269181. ^ Julien, Jean-Pierre; Millecamps, Stephanie; Kriz, Jasna (2005). "Cytoskeletal defects in amyotrophic lateral sclerosis (motor neuron disease)". Novartis Foundation Symposium. 264: 183–192, discussion 192–196, 227–230. ISSN 1528-2511. PMID 15773754. ^ Alberts, Bruce (2015). Molecular Biology of the Cell. Garland Science. p. 889. ISBN 978-0-8153-4464-3. ^ a b Cooper, Geoffrey M. (2000). "Structure and Organization of Actin Filaments". The Cell: A Molecular Approach. 2nd Edition. Archived from the original on 2018-05-02. ^ a b c d e Gunning PW, Ghoshdastider U, Whitaker S, Popp D, Robinson RC (June 2015). "The evolution of compositionally and functionally distinct actin filaments". Journal of Cell Science. 128 (11): 2009–2019. doi:10.1242/jcs.165563. PMID 25788699. ^ Pan, Xiaoou; Hobbs, Ryan P.; Coulombe, Pierre A. (2013). "The expanding significance of keratin intermediate filaments in normal and diseased epithelia". Current Opinion in Cell Biology. 25 (1): 47–56. doi:10.1016/j.ceb.2012.10.018. ISSN 0955-0674. PMC 3578078. PMID 23270662. ^ Herrmann, Harald; Bär, Harald; Kreplak, Laurent; Strelkov, Sergei V.; Aebi, Ueli (2007-07-01). "Intermediate filaments: from cell architecture to nanomechanics". Nature Reviews Molecular Cell Biology. 8 (7): 562–573. doi:10.1038/nrm2197. ISSN 1471-0080. PMID 17551517. ^ Paulin D, Li Z (November 2004). "Desmin: a major intermediate filament protein essential for the structural integrity and function of muscle". Experimental Cell Research. 301 (1): 1–7. doi:10.1016/j.yexcr.2004.08.004. PMID 15501438. ^ a b Lodish, Harvey; Berk, Arnold; Zipursky, S. Lawrence; Matsudaira, Paul; Baltimore, David; Darnell, James (2 May 2018). "Cilia and Flagella: Structure and Movement". Archived from the original on 2 May 2018. Retrieved 2 May 2018 – via www.ncbi.nlm.nih.gov. ^ Fuchs E, Cleveland DW (January 1998). "A structural scaffolding of intermediate filaments in health and disease". Science. 279 (5350): 514–9. Bibcode:1998Sci...279..514F. doi:10.1126/science.279.5350.514. PMID 9438837. ^ Steinmetz MO (May 2007). "Structure and thermodynamics of the tubulin-stathmin interaction". Journal of Structural Biology. 158 (2): 137–47. doi:10.1016/j.jsb.2006.07.018. PMID 17029844. ^ a b Mostowy S, Cossart P (March 2012). "Septins: the fourth component of the cytoskeleton". Nature Reviews Molecular Cell Biology. 13 (3): 183–94. doi:10.1038/nrm3284. PMID 22314400. ^ Mascarelli A (December 2011). "Septin proteins take bacterial prisoners: A cellular defence against microbial pathogens holds therapeutic potential". Nature. doi:10.1038/nature.2011.9540. ^ Huh, G. Y; Glantz, S. B; Je, S; Morrow, J. S; Kim, J. H (December 2001). "Calpain proteolysis of alpha-II-spectrin in the normal adult human brain". Neurosci. Lett. 316 (1): 41–4. doi:10.1016/S0304-3940(01)02371-0. PMID 11720774. ^ Pruyne D, Bretscher A (February 2000). "Polarization of cell growth in yeast". Journal of Cell Science. 113 (4): 571–85. PMID 10652251. ^ Jones, Laura J. F.; Carballido-López, Rut; Errington, Jeffery (2001-03-23). "Control of Cell Shape in Bacteria: Helical, Actin-like Filaments in Bacillus subtilis". Cell. 104 (6): 913–922. doi:10.1016/S0092-8674(01)00287-2. ^ a b Erickson, Harold P. (2017-02-01). "The discovery of the prokaryotic cytoskeleton: 25th anniversary". Molecular Biology of the Cell. 28 (3): 357–358. doi:10.1091/mbc.E16-03-0183. ISSN 1059-1524. PMC 5341718. PMID 28137947. ^ Michie KA, Löwe J (2006). "Dynamic filaments of the bacterial cytoskeleton" (PDF). Annual Review of Biochemistry. 75: 467–92. doi:10.1146/annurev.biochem.75.103004.142452. PMID 16756499. ^ Briegel A, Dias DP, Li Z, Jensen RB, Frangakis AS, Jensen GJ (October 2006). "Multiple large filament bundles observed in Caulobacter crescentus by electron cryotomography". Molecular Microbiology. 62 (1): 5–14. doi:10.1111/j.1365-2958.2006.05355.x. PMID 16987173. ^ Popp D, Narita A, Maeda K, Fujisawa T, Ghoshdastider U, Iwasa M, Maéda Y, Robinson RC (2010). "Filament structure, organization, and dynamics in MreB sheets". The Journal of Biological Chemistry. 285 (21): 15858–65. doi:10.1074/jbc.M109.095901. PMC 2871453. PMID 20223832. ^ Popp D, Narita A, Lee LJ, Ghoshdastider U, Xue B, Srinivasan R, Balasubramanian MK, Tanaka T, Robinson RC (2012). "Novel actin-like filament structure from Clostridium tetani". The Journal of Biological Chemistry. 287 (25): 21121–9. doi:10.1074/jbc.M112.341016. PMC 3375535. PMID 22514279. ^ Ausmees N, Kuhn JR, Jacobs-Wagner C (December 2003). "The bacterial cytoskeleton: an intermediate filament-like function in cell shape". Cell. 115 (6): 705–13. doi:10.1016/S0092-8674(03)00935-8. PMID 14675535. ^ Esue, Osigwe (January 2010). "Dynamics of the Bacterial Intermediate Filament Crescentin In Vitro and In Vivo". plosone.org. Retrieved 12 September 2017. ^ a b Woodhouse, Francis G.; Goldstein, Raymond E. (2013-08-27). "Cytoplasmic streaming in plant cells emerges naturally by microfilament self-organization". Proceedings of the National Academy of Sciences of the United States of America. 110 (35): 14132–14137. arXiv:1308.6422. Bibcode:2013PNAS..11014132W. doi:10.1073/pnas.1302736110. ISSN 1091-6490. PMC 3761564. PMID 23940314. ^ Goldstein, Raymond E.; Meent, Jan-Willem van de (2015-08-06). "A physical perspective on cytoplasmic streaming". Interface Focus. 5 (4): 20150030. doi:10.1098/rsfs.2015.0030. ISSN 2042-8898. PMC 4590424. PMID 26464789.